Sangiran’s new museum is set to open in a couple of years, showcasing the finds of homo erectus in Java. Fossils of prehistoric elephants and plants have been found in Blora, central Java by a team from the Bandung Geology Museum. Numerous fossil finds in the Patiayam have shown that the mountainous region in Java is rich with faunal remains dating back to a million years BP. The potential richness of these finds have been compared to the other famous prehistoric site Sangiran. However, there has been little able to be done with these finds due to a lack of resources and funding. Link is not static, and the story remains on the Jakarta Post website for seven days. 28 April 2007 (Jakarta Post) – In the heels of the fossil crocodile find near the Sangiran site, a fossil of a mammoth is found. A resident has discovered fossilized mammoth bones near where the fossil of a prehistoric crocodile was discovered at the Sangiran excavation site on April 20. Gunawan, a staff member at the Sangiran Agency for the Preservation of Ancient Sites, said this latest discovery took place April 22, but was only reported to his office four days later. “The mammoth fossil is believed to be from the same era as the crocodile found earlier,” Gunawan said Friday. Officials earlier said the crocodile fossil was believed to come from the Middle Pleistocene era, about 800,000 years ago. 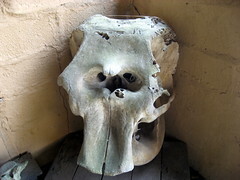 According to Gunawan, the fossilized mammoth (Stegodon trigonocephalus) was found by Daryanto, a resident of Dayu village in Gondangrejo district, Karanganyar regency. 24 April 2007 (Jakarta Post) – The fossil of a prehistoric crocodile has been found in Sangiran, already famous for being the site of the discovery of Java Man. The fossil of a prehistoric crocodile has been found at the Sangiran site in Sragen, Central Java, by a local resident. “The first bit (of the fossil) that I found was the teeth of its upper jaw,” Mulyono, 31, told reporters at the Sangiran Fossil Laboratory on Monday. Mulyono explained that the finding was quite by chance, as he was digging an irrigation gutter in his rice field. “Suddenly, I found the fossil,” Mulyono said. The discovery was made Friday and the excavation was carried out the next day. On Monday, a number of employees from the Sangiran laboratory were still busy cleaning the fossil, which has a diameter of 49 centimeters and a length of 95 centimeters. Gunawan, one of the employees, said the fossil was believed to have come from the Middle Pleistocene era, about 1.6 million years ago. “This is still a preliminary estimation, taking into consideration the location of the discovery at a hilly area in Pucung village in Kalijambe district, which has been classified in the Kabuh formation or the Middle Pleistocene era,” he said. So far there has been no formal statement on how scientists will calculate the age of the fossil. “This is still being studied by archeological experts from the Sangiran Museum,” Gunawan said. 21 Apr 2006 (Science) -Preliminary report on new findings on the Java Man that will put associated tool findings as one of the oldest outside of Africa. In 1998, Widianto found stone flakes in the 800,000-year-old Grenzbank layer at Sangiran, whose well-plumbed sediments reach back 2 million years. Then in September 2004, his team struck gold in a layer dated by extrapolation from the rocks around it to 1.2 million years ago. Over 2 months, they unearthed 220 flakes–several centimeters long, primarily made of chalcedony, and ranging in color from beige to blood red–in a 3-by-3-meter section of sand deposited by an ancient river.